Howard Miller makes a beautiful round coffee table with clock. The strong metal frame is finished in burnished umber with gold highlights. The glass top table has a sharp looking antique clock dial that lies just beneath the glass. The black hands and gold accented medallion located in the center of the dial give the table clock a great look. 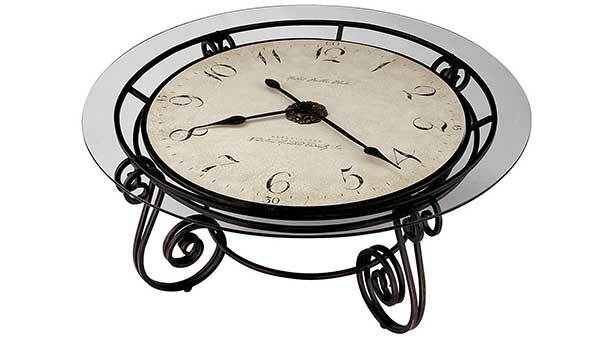 A round coffee table clock is a great addition to any home or apartment. The Quartz, battery operated movement makes the clock reliable and accurate. The round table measures 40 inches across and 17.2 inches tall. The table works great as a cocktail table or small coffee table. The Howard Miller company is known for making high quality unique clocks and furniture. To get the latest product information, pricing information, shipping details, or to buy this clock on Amazon, just hit the check it out button at the top of the page. If you have questions or comments about this table, feel free to leave them below.